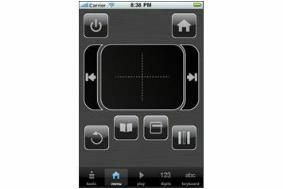 Philips launches TV remote app for iPad, iPhone and iPod Touch | What Hi-Fi? The Philips WiFi TV Remote app also works with Apple's iPod Touch and is compatible with all Philips NetTV sets, including the 2009 year 8000 and 9000 product ranges and all 2010 7000, 8000 and 9000 series models. Owners of 2009 sets will have to perform a USB-only firmware upgrade by following this link. Once installed, users can access basic TV features such as volume control, changing channels or turning the TV on and off, as well as advanced control of the Philips Net TV application from their iPhone/iPad. The app offers text typing as well as a virtual keypad, particularly useful when using the TV's internet browser. It also allows direct transfer of photos from your portable to the TV.